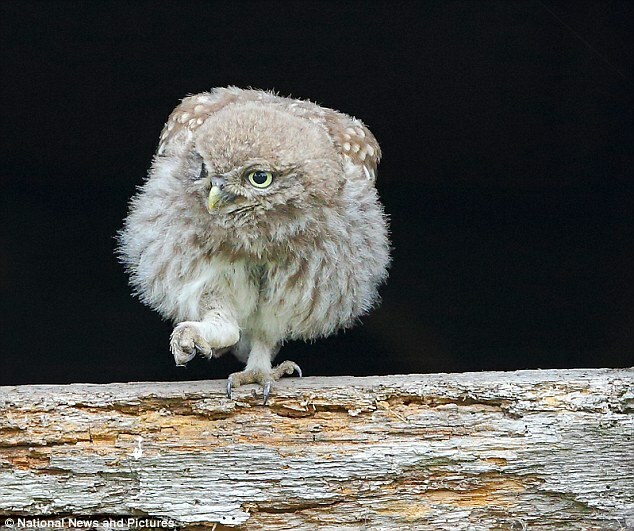 For any young owl, the first flight out of the nest is a nervy occasion. 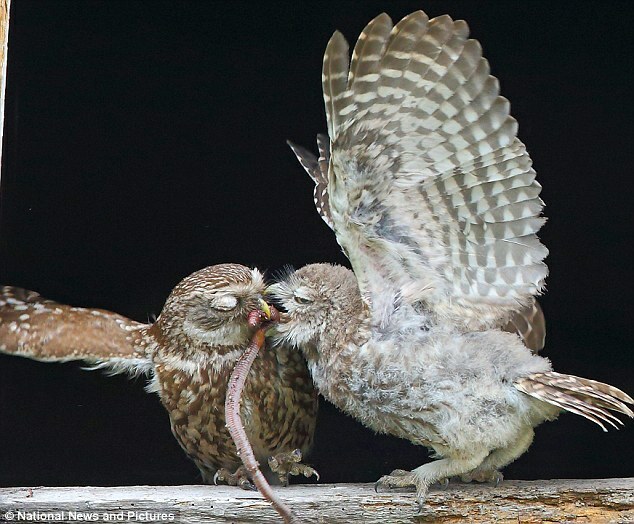 And as these incredible pictures show, for this baby owl in Merseyside it was no different. 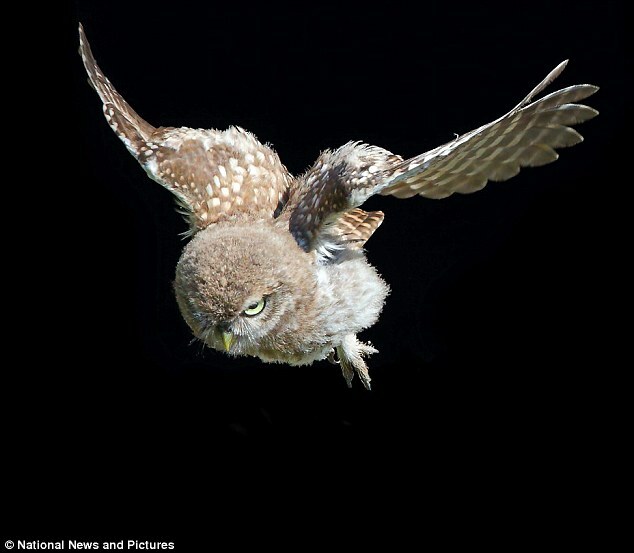 Photographer Steve Ward caught the moment a tiny owl decided to make its first successful flight from its nest in a disused barn. 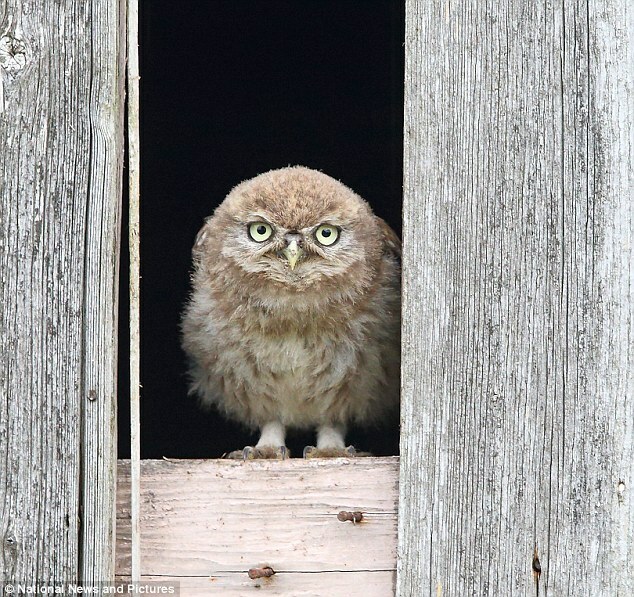 Just a week ago, Mr Ward caught the owlet with a sibling each standing on one leg on a ledge of the barn. They had begun to edge out from the nest as they became more bold in readiness to fly. 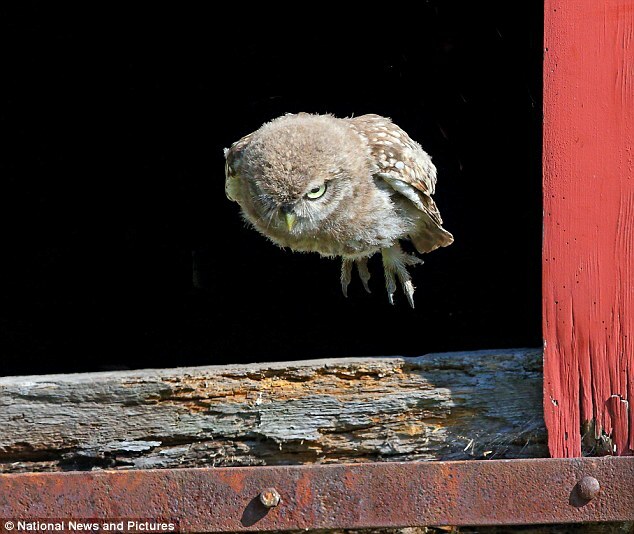 He has kept an eye on them ever since and finally caught one of them launching itself off the barn for its first swoop. Mr Ward , 34, set up his hide about 12 metres from the barn and was even forced to strip to his boxers in the sweltering heat inside as he waited up to 17 hours a day to get the shots. 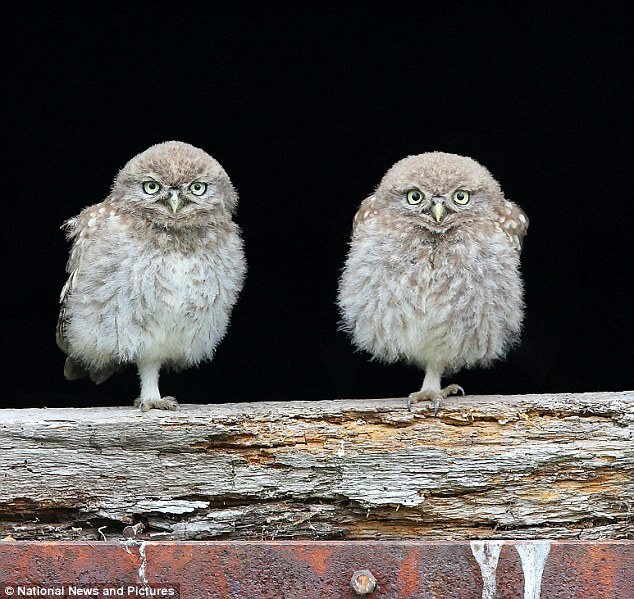 He said: 'I loved the pictures I got last week, especially the one of the pair of owlets each standing on one leg. 'It is the one on the left that I finally captured flying. 'I could tell by how bold they were becoming, edging out onto the ledge to be fed by their mum, that they were getting ready to learn to fly. 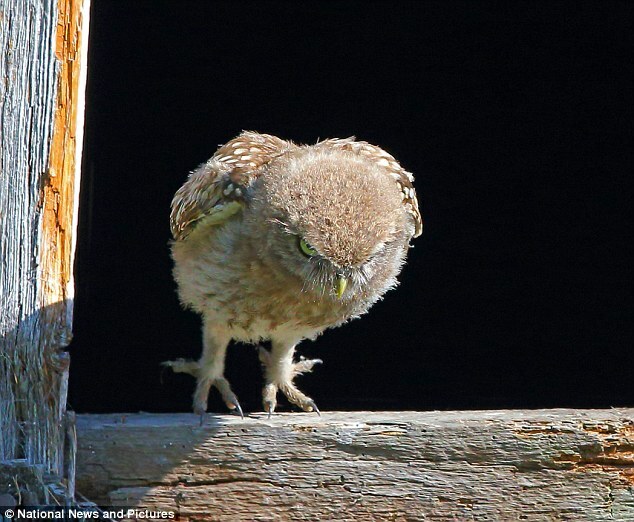 Mr Ward said it was at about 10am when one tiny owl showed its face. He said: 'Looking confident it stretched its wings, checked the flight equipment and posed like a true caped crusader. 'Then it scratched the surface beneath its feet to make sure the ground was firm, checked the sky for clearance and potential predators and took a leap - straight down on the grass below like a cannon ball. 'It all happened incredibly quickly and the pictures of it on the ground looked very messy. I was also laughing at the sight in my camouflaged hide. 'Flapping its wings it managed to hop back up on the barn door for a second and third attempt as its mother hooted encouragement from a tree about 45 feet away. Mr Ward said that the conditions did make the shoot difficult. He said: 'After a 17 hour shoot in the hide from 5am to 9pm I was exhausted and down to literally my boxer shorts as it was 28 degrees and with no breeze in the hide it gets seriously hot. It was a good job I took a few litres of water with me. 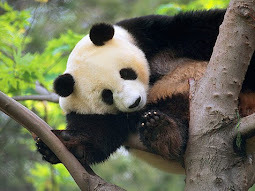 'But these are lengths us nature photographers have to go to to get and witness such wonderful moments such as these.